Finally just finished watching the movie “The Book Thief” (yes, it took me several nights to be able to finish it – I’m getting that sort of old ha) and it was great. Spoiler alert – I would highly recommend. For those who haven’t seen it, it’s the story of a young girl growing up in Nazi Germany who discovers a passion for books. Well, that’s the skeleton of the story. Its really a story about the people and the friendships that make up her world. Its about seeing the brightness of humanity, even in the darkest of times. Its an interesting perspective, because I think in the US we are generally used to seeing the Nazi Germans as the ‘enemy’ and think about how they all stood by and did nothing while the jews were burned. But this story brings us to the other side of the wall, and shows life in a small town where mostly people are just swept along by forces bigger than themselves, and those who try to push back against that tide, even in small ways, are literally violently knocked down to the side. And we see the fear in their faces as the allied bombs fall. Really in war, there are no winners. And there is the blunt, direct reminder from the voice of death that: all people die. And the few people who lived a life so full, to give death pause. Finally, it is the story of the power of words. 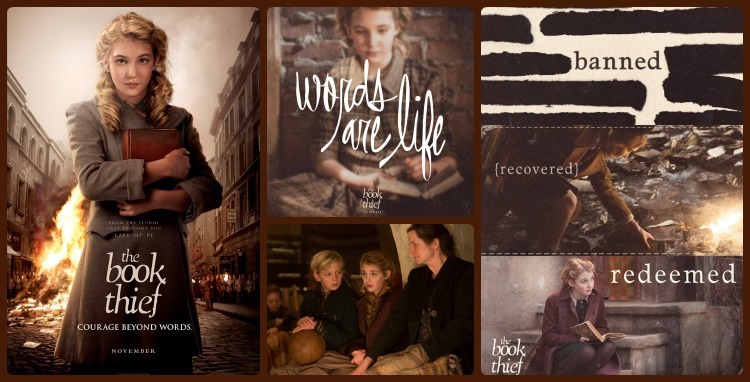 “Words are life, Liesel. All those pages, they’re for you to fill.” Which is why I’m really excited to start reading the book that inspired the movie. Because there is something about a really well written line that lights up the exact same pleasure sensors in my brain as eating a perfectly piece of fudgy chocolate cake. and im going to hug a bit hard the people i love.